If you want to build a ship, do not call people together to collect wood, share the duties and allocate the tasks. Teach them the longing for the vast ocean. There came the time when I felt I had to summarize my experiences in my own book. Even today I read everything that comes to hand about network and referral marketing. I am convinced that you never stop learning and that it is of utmost importance to keep improving and to be curious about the world that surrounds us. My first book “From Person to Person” was written within a few weeks and over 200,000 copies of the German version have been sold. It has been translated into seven languages and excerpts are now available in ten more languages. Concentrated experience, simple explanations, a precious tool! Of course I like to tell my story and share my experience and knowledge during lectures. This book is intended to be a tool to throw more light on our valuable work of referral marketing and to motivate and inspire people. It is so easy to lend a book to someone and, in this way, give them the possibility to learn at their own pace – this is another reason why I wrote the book. You can order my books directly via amazon following this link. A simple but fantastic tool! The book is available in the original German and has been translated into English, Spanish, Italian, Dutch and Turkish. You can also order the English book, directly via amazon. 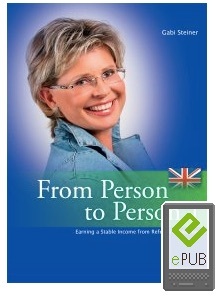 Also interesting: “Form Person to Person Vol.2” is now availibe as ebook! My longstanding experiences in paperback. Now available in several languages – condensed information coupled with a touch of humour. I wanted to introduce this life concept to people who have little time to read because they are always on the move. A compilation of interesting press articles about health and referral marketing for downloading – all free of charge.